Terrington St John smockmill stood in Mill Road and was operating during the 1800s using common sails. 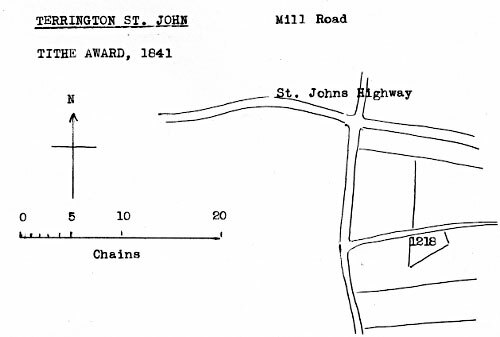 All that MESSUAGE or TENEMENT and 3 roods of land (more or less) under the same together with a Smock Wind Mill erected thereon, mill stones, sail cloths, implements, going geers, furniture and appurtenances to the same belonging, situate and being in Terrington St. John in the county of Norfolk near the turnpike road from Lynn to Wisbech. The underworks of the mill are entirely new and half the purchase money may remain on security of the premises. Apply to Mr. Henry Wright of Clenchwarton near Lynn. .
Joseph Bush Cox married Elizabeth Johnson on 27th October 1814 in Terrington St. John. He wrote a will on 17th December 1836 and died on 20th December 1846 with his will being subsequently proved on 3rd March 1847. In his will Joseph Cox left property in trust to two people including Benjamin Johnson, Bart, for division amongst his children: A married daughter, Mary Brett and sons John Bush Cox, George Bush Cox, and Joseph Bush Cox along with another daughter Emma Cox. On 13th December 1841 he gave a codicil, in which he mentioned that the cornmill was in the occupation of his son George Bush Cox but that he should pay £200.00 from his share if he wanted to keep it.